Roth high pressure, low NPSH, multi-stage chemical pumps solve the most difficult pumping problems. These pumps can handle continuous non-pulsating differential pressures up to 2000 psi (141 kg/cm2) and up to 5400 ft. (1646m)TDH. They provide low NPSH and are quiet, too. Capacity 4 - 150 GPM (.912 to 34 m3/hr). 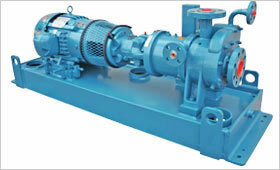 The non-pulsating discharge pressure makes the Roth pump ideal for de-superheating operations. Roth multistage chemical pumps offer the highest pressures ever developed at 1750 RPM in a single low NPSH turbine pumping unit. Up to six stages can be combined in a single regenerative turbine pump. Detachable suction and discharge connections can be repositioned to suit pipe layout. Socket weld connections can be provided for high pressure pumping. For more information on Multistage Chemical Pumps request bulletins A109. 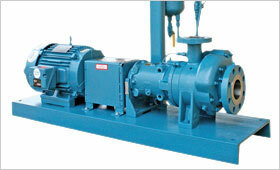 Roth Pump offers a variety of chemical pumps for improving the operation and efficiency of process systems.